Elucida Oncology is developing ultrasmall (<10 nm) hybrid silica particles, C'-Dots, for guiding highly targeted image-directed surgical treatment and/or efficient delivery of small-molecule therapeutic agents and radio therapeutics. The company is actively looking for partners to jointly leverage the C'-Dot platform to explore game-changing opportunities in cancer care management. Since 2016, Elucida Oncology has been focused on transforming outcomes for patients with primary tumors or metastatic disease through theranostic approaches. The company’s ultrasmall and modular hybrid silica particles, or C'-Dots, which can be customized to accurately deliver diagnostic, imaging, and/or therapeutic agents to cancer cells, embody this approach. Elucida is engaged in a number of clinical trials investigating the use of C'-Dots for the image-guided cancer treatment of primary and metastatic disease. Preclinical proof-of-concept studies are also under- way to test the potential of the C'-Dot platform to help transform drugs with marginal efficacy, excessive toxicity, or unfavorable pharmacokinetic profiles and/or solubility, into higher-value assets. The company is looking to expand its network of partnerships to maximize the potential of the C'-Dot platform to vastly improve clinical outcomes in oncology. “At Elucida, our simple goal is to reduce the dis- ease burden on cancer patients, and the C'-Dot plat- form is an ideal tool to improve upon the standard of care across the spectrum of diagnosis, surgery, and therapeutic treatment for cancer patients,” said Geno Germano, president and CEO of Elucida. Elucida’s C'-Dots, originally developed at Cornell University and translated into oncology at Memorial Sloan Kettering Cancer Center (MSKCC), are ultrasmall (<10 nm) nanoparticles (Fig. 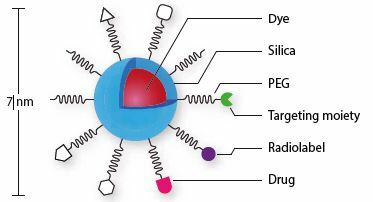 1) that provide diagnos- tic and therapeutic—theranostic—capabilities distinct from other previous nanoparticles and delivery platforms (Fig. 2). Fig. 1 | The structure of Elucida’s C'-Dots for cancer theranostics. C'-Dots are ultrasmall (<10 nm) hybrid silica particles developed for highaccuracy imaging, image-guided surgical treatment, and/or targeted delivery of therapeutics in cancer. PEG, polyethylene glycol. 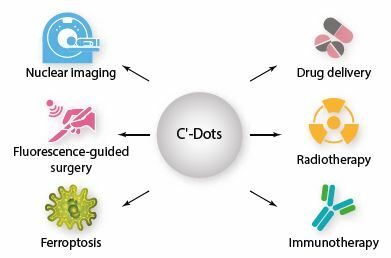 In particular, it is the physicochemical and pharmacokinetic properties of the C'-Dots that make the platform a first-in-class theranostic for the diagnosis and treatment of cancer. Their ultrasmall size and specifically designed surface-chemistry properties enable a ‘target or clear’ strategy, allowing for (1) effective targeting and penetration of tumor cells, resulting in more efficient drug delivery, including across the cancer-disrupted blood–brain barrier, (2) >90% clearance through the renal system, reducing the risk of off-target adverse events, and (3) increased surface-area-to-volume ratios compared with larger- sized nanoparticles, conferring the C'-Dots with high drug-loading capacities and ligand numbers. The highly biocompatible materials and versatile manufacturing process involved in producing the C'-Dots further set apart these nanoparticles. The basic structure of a C'-Dot consists of a rigid silica core that encapsulates a near-infrared dye—increasing its brightness and exhibiting fluorescence with a wavelength in the range 650–850 nm—and a neutral polyethylene glycol (PEG) coating that provides steric stability and biological inertness. This structure facilitates the linking of ligands of interest such as tumor- targeting moieties, peptides or antibody fragments, drug molecules, and radioisotopes (Fig. 2). applications including both diagnosis and therapeutics. C'-Dots are synthesized in aqueous solutions using a unique and highly efficient chemical approach that allows the silica core to be precisely engineered at the single atomic layer level and that integrates PEGylation and surface functionalization steps into a one-pot-type batch reaction. This approach provides outstanding reproducibility and batch-to-batch consistency, allowing for the industry-standard scaleup of C'-Dot manufacture for commercialization. Elucida has several ongoing clinical collaborations, including a clinical trial with MSKCC using C'-Dots for real-time fluorescence-guided surgery, and an imaging trial, also with MSKCC, using C'-Dots for positron emission tomography imaging of tumors in patients with malignant brain tumors. The C'-Dots are also being investigated in collaboration with a major industry leader in oncology for use with a series of drug conjugates and an antibody-fragment- targeting moiety. The company is now looking to expand its net- work of collaborations to include industry partners interested in evaluating the potential of the C'-Dot platform as a low-cost, low-risk opportunity to vastly improve the clinical profile of their cancer therapeutics. Elucida Oncology, Inc.is a biotechnology company focused on clinical research, development and subsequent commercialization of life-changing products based on the Target or Clear™ technology of our novel, ultra-small nanoparticle delivery platform. Our work is centered around the detection and treatment of primary solid tumor and metastatic cancers. Our goal is to leverage our novel platform to extend and enhance as many lives as we can.